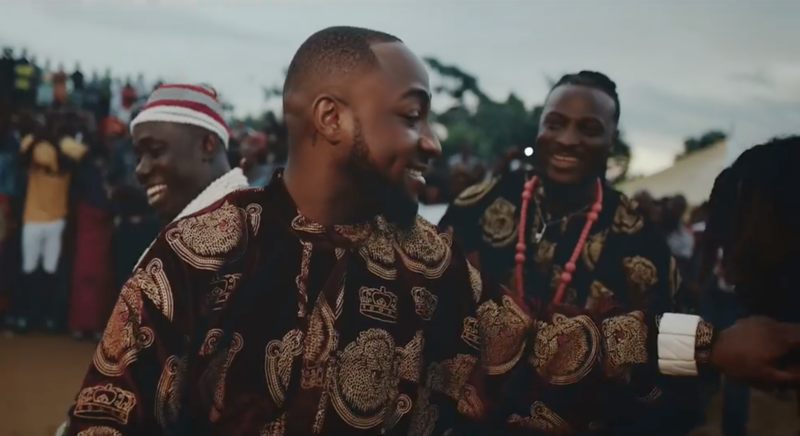 DMW’s “AZA” music video diverts attention away from the song’s lyrics, yet, it definitely offers a reminder of what it means to be Nigerian; what we’ve had in many music videos is content in foreign ideas and attitudes. A music video isn’t always a concept video; it is simply accompanying visuals to adequately and richly promote the music. The “AZA” music video, shot in Port-Harcourt and directed by Clarence Peters, enhances shared consciousness and connectedness. Like the song’s audio, Duncan Mighty makes an exhilarating visual introduction in the video, partly submerged in a river with a bold lion mask. The rest of the video shows Davido and Peruzzi on the streets of PH with many many, people and (actual) babies. One of the most symbolic scene is set as a village square with community people, elders, masquerades and a lot of dancing that depicts African-Nigerian mannerism and the good culture of the Igbo people. It’s a strategy for DMW to keep winning the hearts of people internationally —and of course worldwide. There’s a message here if you try to find one. Meanwhile, it’s clear they all had a great time shooting it. Check it out below.